anywhere from 1 to 7 embryos inside. these egg casings are produced by the female skate and after fertilization are deposited on the ocean floor. 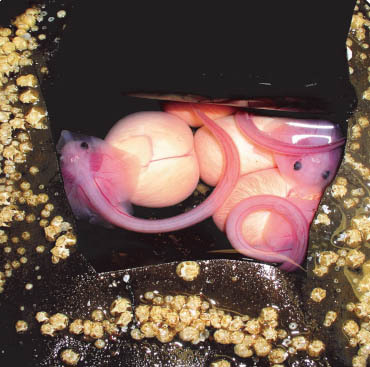 A single casing can have Large surf and heavy storms will sometimes dislodge the egg casings from the ocean floor and push them up onto the beach. If stranded on the beach the casings will dry up and the embryos inside will perish. People who find these casings on the beach can bring them to the Seaside Aquarium. Here the casings will be put into a salt water tank where the embryos will have a chance to continue to develop. inside of their egg casing. 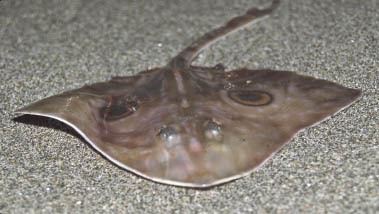 Above right: Juvenile big skate.